ABU DHABI, 12th August, 2018 (WAM) -- The Abu Dhabi National Oil Company, ADNOC, today observed the International Youth Day across its headquarters and all operating companies. During the celebrations, which were organised by the Group’s various youth committees, ADNOC’s young talent focused on the contributions they have made to the business to enable enhanced performance, profitability and efficiency, as well as their aspirations for the company and the UAE. 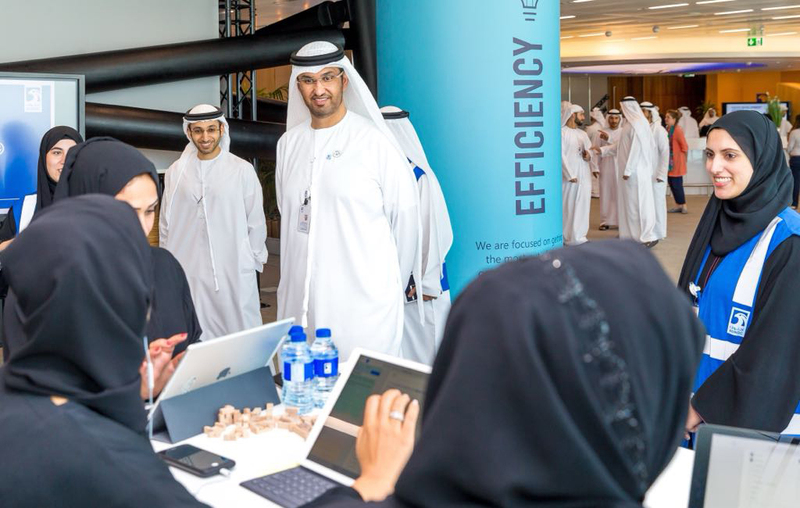 During his participation at the events, Dr. Sultan Al Jaber, UAE Minister of State and ADNOC Group CEO, said, "Our youth are the bedrock of ADNOC’s future. They play a pivotal role in unlocking our full potential and delivering on our 2030 smart growth strategy. We invest in our young people and enable them to think differently so we can seize the material growth and value creation opportunities across the company’s operations." "Given the importance of our young talent, we have established a focused approach to attracting and retaining the best and brightest minds and ensuring that we provide them with the space and opportunities to develop their full capabilities. ADNOC has a long history of investing in UAE youth and nurtures an exceptional talent pool that our company and our nation taps into," said Dr. Al Jaber. ADNOC’s life-long learning strategy ensures that robust development and learning experiences are in place throughout an employee’s career, built on a competency-based and structured approach to capability building. This includes on-the-job learning and ensures the company’s youth can realise their potential and deliver business value. This year alone, some 300 students from ADNOC Technical Academy, ATA, have embarked on structured on-the-job training programmes at ADNOC facilities in the UAE. This ensures that future technical talent is equipped with a wide range of mechanical, technical and instrumental skills needed to understand and lead processes in the oil and gas industry. In recent years, the company has also reinvigorated its investment in leadership development of its young employees through the ADNOC Future Leaders, AFL, programme. Participants have developed and introduced several new business opportunities, through innovative thinking, that have already been taken up by the business. Out of the AFL programme, the ADNOC Youth Council, AYC, was born with the mandate to engage with youth within and beyond ADNOC. The AYC collaborates with the Abu Dhabi Youth Council and Emirates Youth Council. It has enabled the creation of Youth Committees across the ADNOC Group and champions youth interaction and engagement at major industry events. Saud Al Shamsi, Chairman of the ADNOC Youth Council, said, "We are fortunate and proud to be part of an organisation that, following the vision of our Founding Father and our leadership, is fully committed with the development and engagement of its youth. ADNOC’s ongoing investment in its young talent will help secure the company’s leadership position for the long-run and ensure we maximise value in the service to our nation." 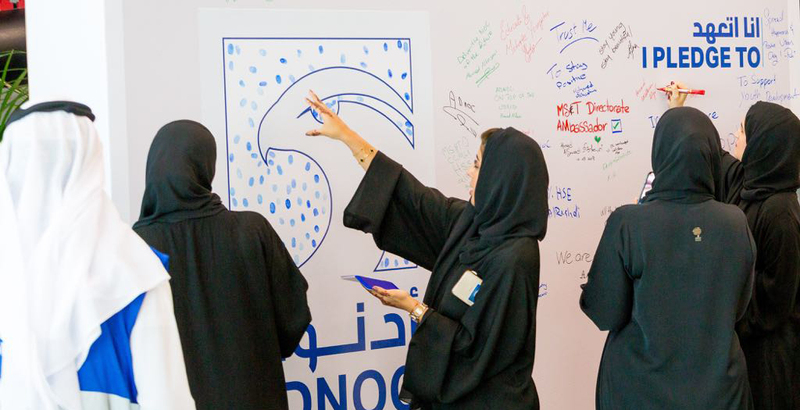 One of ADNOC’s Youth Committees initiatives was the signing of a pledge to give back to the nation in the spirit of the late Sheikh Zayed bin Sultan Al Nahyan. In addition, young talents presented their hobbies within the XHub initiative, which focuses on encouraging, motivating and optimizing individual talents. Recently, a group of 20 UAE Nationals have also become the first group of trainees to start a two-year professional development programme, aimed at developing a world-class workforce with enhanced advanced technology and innovation capabilities, at the Schlumberger Middle East and Asia Learning Centre. This is part of a joint initiative between ADNOC and Schlumberger, one of the world’s leading oil and gas industry technology and service providers. ADNOC’s participations in the International Youth Day reaffirms its commitment to talent and leadership development of its young employees.